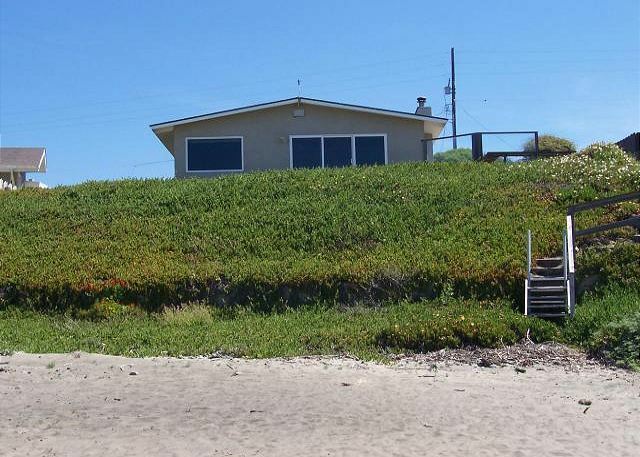 Charming single story oceanfront home located a short distance from downtown Cayucos and the Cayucos Pier. The beautiful home has panoramic views from the kitchen, living room, and dinning area. 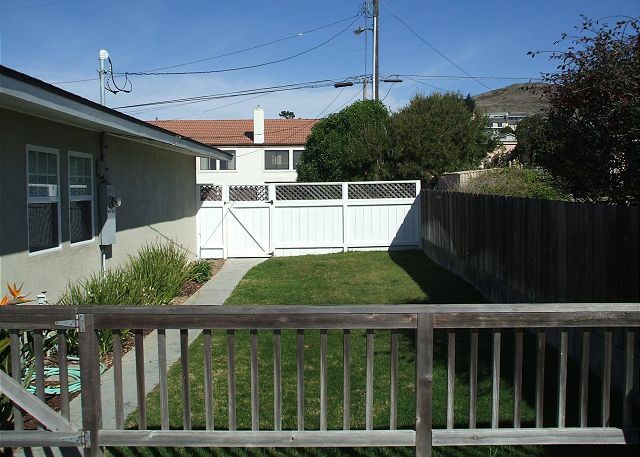 Off of the living room is a large glassed in deck and a fenced in grassy side yard. Non-Smoking, no pets, linens & towels not provided. NIGHTLY MINIMUMS VARY SUMMER AND HOLIDAYS. Rhonda and Theresa are great to work with !! The house was the perfect size for us. The steps to/from the beach need to be changed. We’ve been coming to this house for over 14 years. We love coming here and wish we could stay longer. Each time we’ve stayed the house has little updates here or there. The windows, slider and deck are the highlights for our family. We love, love, love staying here. This was our third year at this house and there will be more to come. The house is always clean and well appointed. The views and beach access can’t be beat. Loved our stay here! Incredible views of the ocean out multiple windows. The beach was a bit windy, so we sat either in the grass yard or on the deck which was perfect. Great, new BBQ outside too, which my husband loved. This is the perfect distance to downtown Cayucos, and at the end of a small cul de sac, so it is very private and quiet. Need to make my reservation for next year! This is a great place to get away and relax. We live in the big city (LA) and just enjoy the peace and quiet we get here. It’s a perfect place to totally relax and enjoy the beautiful beach! Everything was great, except they need new frying pans everything sticks to the ones they have. Other than that we will return whenever we can! Great Location!!!! Enjoyed our time away from the big city. Love Cayucos. Has that quaint feeling and everything was within walking distance. Restaurants, Antique Stores, and coffee shops. Will be back. Loved the sunsets. The unit was spotless. Our stay couldn’t have been more relaxing. 3 gals and a beach! The weather was divine and the house, as always, was clean and cozy! I have rented this house many times and I am never disappointed. It is clutter free, comfortable, clean and has great views. Very comfortable and in good repair this house is a favorite! We had a great time at this house by the sea . We stayed for a month and we will be back. This time the whales were all over the place. What a show . We have stayed in this place many times . The house is well maintain and is great for us. We had some close friend stay with us for a few days but for the most part it was just the two of us. There is something about the ocean that works on your body and mind . The staff at Coastal is second to none. They took care of all of our needs . They just know how to make you feel welcome. Always great to see them. We will be back soon . Found a new home away from home with 40 Ocean Front Ln. Staff was very accommodating with family needs. Great location, great views !! This is great little beach house, every room has ocean views, every room !! Rhonda and Teresa are great to deal with st Coastal Escapes. This is the second time in this house. We love the location. It is only 2 bedrooms. 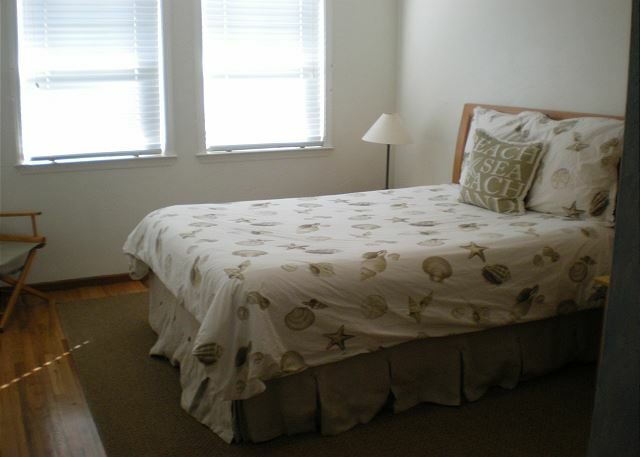 If 2 adult couples are staying, the size of the twin beds are not at all comfortable for large men or women. We have stayed at this home before & it is well maintained. It has everything you need in the kitchen; however there was no dishwashing soap. Great access to the beach and town. We have stayed in this little house many times during the past 20 years. We have seen many positive changes, i.e. a remodel of the kitchen and full bath and the addition of a half-bath; addition of an outside hot water shower (a must for a beach house); a redo of the stairs to the beach; a much welcomed addition of a chair in the living room; and new hardwood floors throughout the house. It's always been the perfect getaway, but this year we had an ant problem which we know was due to the recent heavy rains. Other than the ants, everything was perfect. 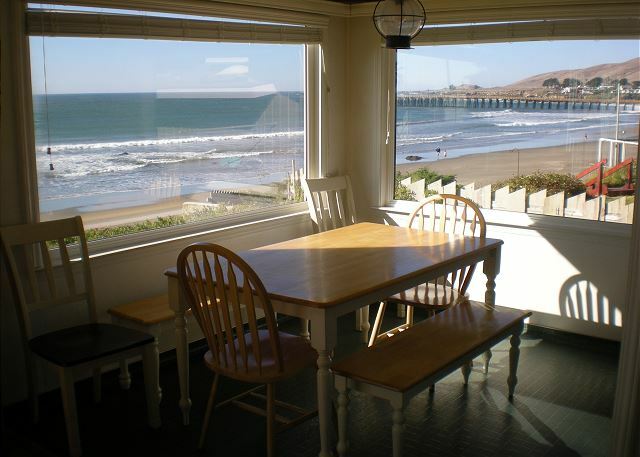 We have stayed at 40 Ocean front line for many years and it is our favorite retreat in Cayucos! We love the location and the view. We stay here each year year. In the past 2 years, we have times our stay to visit the Cambria Christmas Market. We love the house - great location and views. Four of us girlfriends have been staying at 40 Ocean Front Lane for several years. That is why we call it "our" beach house and we love it. Just right for the four of us and because we rent during the week, it is also affordable. Just need to add two more chairs with backs to the kitchen table. The benches are only good for a while and the back needs support. Clean and in good repair with terrific access to the beach-I live this house. This is a clean, uncluttered ocean front home on a quiet street. Love this house on the bluff with views of the pier and Morro Rock. This is the second year we stayed for 31 nights. It is hard to describe the feeling you get when you are there for a month. It doesn't take long and you are just in relaxation mode. This unit makes it easy to make you feel at home but with a great view. The weather was great. We went to some deferent places to eat and did a few side trips. We like to stay in as much as we can . You view and the sea life is second to none. Got a chance to talk to owners , just great people . The staff at Coastal Escapes are the best . We will be back . We have stayed here many times and other houses too. This is by far a favorite. The key features that make it a favorite are location, size, cleanliness and always in good repair...oh and location. Have been saying here a couple years now and love this house and its location. Upgrades to the house this last year were noticed and appreciated (floors, furniture). Bottom of stairs to the beach still need some work as they are a bit dangerous to make that final big step down. Otherwise, love the place and will keep coming. This is a great house. You couldn't ask for better views or location. This was our first vacation rental and we've already booked the next two years! Perfect for a couple ! We had an amazing time . The property is lovely. Spectacular view. Clean house. Friendly staff at Coastal Escapes. Will do again and again. 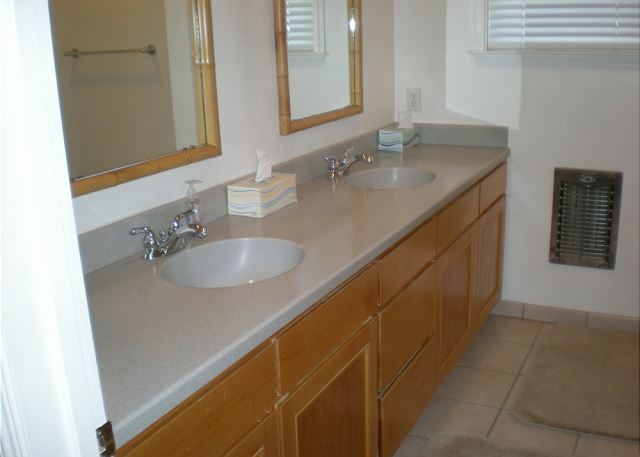 This property is always clean and well maintained, with upgrades each year. We have been enjoying this beach house for many years and more planned. Great weekend for the family. Walking distance to the main strip. Our little girls loved it. House was very clean. We had a great time! Four friends of 50+ years getting together at a fantastic home on the beach! A few of us have stayed here before so we knew how much we would like it! Only wish is that it had two doubles in the second bedroom. We had so much fun, laughter, relaxation and a most wonderful ocean view. We Had a small problem with ants. We sort of shared our kitchen with them. They really didn't cause a big problem. Thank you for a wonderful stay. We always love being in Cayucos, even the rain did not diminish our good time. # 40 has great views and the location is the best. Love the deck! The new table set on the deck, great! It was so rewarding to wake up to the ocean each morning and watch the sunset each evening. The house is very comfortable and great location. Walk everywhere! The kitchen was well stocked with everything we needed. Hope to stay there again and use the fabulous BBQ area. Very nice...the house is great and we enjoy our stay each time. The only suggestion would be to fix or replace the last five steps on the stairs leading to the beach. They are getting hard to navigate...especially as we are growing older. We loved the improvements you have made. The couches are beautiful and comfortable. The hardwood floors are gorgeous since you've had them refinished. The Dutch door provides addend ventilation. The new table and chairs were a special deck treat! Your home is always uncluttered and clean, and now it has new furniture, too! Thank you for sharing such a lovely home and perfect location. This is the first time we had stayed anywhere for 31 nights. We had a few fiends stop by and some family stayed for a few nights. For the most part it was just the two of us and I can't begin to say how good it was to be there. We had plenty of time to try new places to eat and there is a lot of activity on the weekends. We had met the owners and express our feelings about the house. They are great people and enjoyed meeting them.The weather was just perfect . The sunsets were just great. You really get comfortable when you are in that place for that length of time. We walked everyday and met a few new people . This house is just perfect. The staff at Costal Escapes are the best. They know how to treat people. This is not the first time we had stayed here and it won't be our last. We are looking forward to the next visit. We just love the coast and staying in this house makes everything so much better. Great Location, great views, walk into town. Working with Theresa and Rhonda is Great !! Enjoyed the location/house very much. Nice house, plenty of room, and nice view. We have stayed at this charming beach house several times, and it is always a treat! We will return soon. We went to Cayucos to celebrate my 40th b-day and couldn't have picked a better location. The first thing I noticed when walking into the house was that it was spotlessly cleaned (cleanest vacation rental I've ever seen). Kudos to whoever does the cleaning. 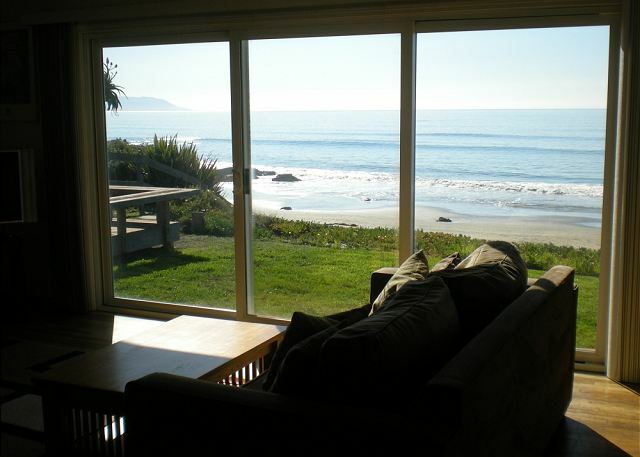 This house was well maintained; has incredible views (including dolphins, seals, otters, birds, etc.) from HUGE windows, patios, and yards; has direct beach access; and was walking distance to all of the restaurants/shops in town. 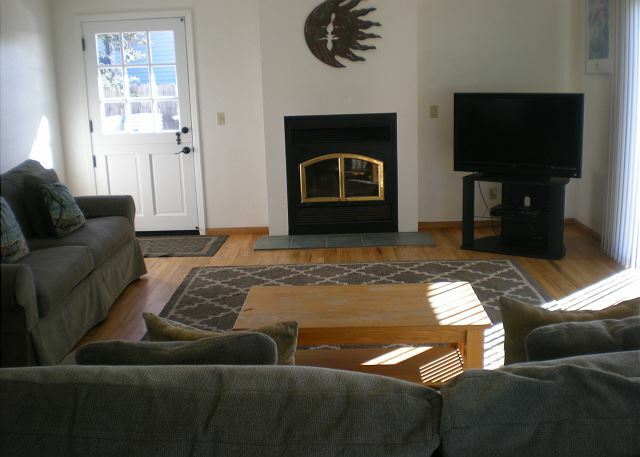 Inside the house is nice/simple and has all of the features that you might want or need, including a washer/dryer, dishwasher, coffee pot, cookware, grill, flat screen, DVD player, Wi-Fi, etc. There was even a TV and DVD player in the 2nd bedroom, which would be convenient for putting on a movie for the kids. The best part was that we could open up the windows/sliding glass door and lounge around the house without feeling like we were missing out on the beach experience. We could even hear the waves crashing from inside. The only three very minor negatives were that the stairway to the beach is missing the last step, so it would be tougher for some to get down (I would bring a step stool next time); that, due to the beach location, we killed about 10 spiders in the house (I would bring bug spray); and the doors/floor are pretty noisy when others are sleeping (I might WD-40 the bedroom doors). Again, all super minor in comparison to what an incredible house it is. The rental company was very cooperative and everything seemed to go very smoothly from the beginning. The one suggestion I might have for the rental company would be to accept credit cards for total payment. This would be much more convenient/preferable than a check or cash. Overall, the house was amazing!! Best vacation rental ever! I have already recommended Coastal Escapes and this particular house to friends looking for a great vacation spot. I can't get back to this house fast enough!!! We spent five nights at this what I call a perfect place. We had some college friends come up and stay a few days . We had perfect weather and the food is just the best. But you will never forget the view. Ronda as always is the best. We will be back. My friends and I have rented this home about once a year for several years now. It is well equipped, clean and has the most incredible views as well as a peaceful and quiet environment. Staying here restores our souls. My husband and I have a bi-coastal marriage. He is native Californian & I native Pennsylvanian. We rented the house at 40 Oceanfront Cayucos to celebrate his birthday. We had friends from the east coast join us along with family from CA for a wonderful dinner & celebration. The views were breathing-taking every day!We plan to come back. we always find out time in cayucos so relaxing. this house is a big part of the experience. This is such a clean home with a great view. My sister and I enjoyed our stay and we will return next year. We have visited Cayucos for over 21 years and plan to keep on. This house is the one we have settled on as our favorite due to size and location. 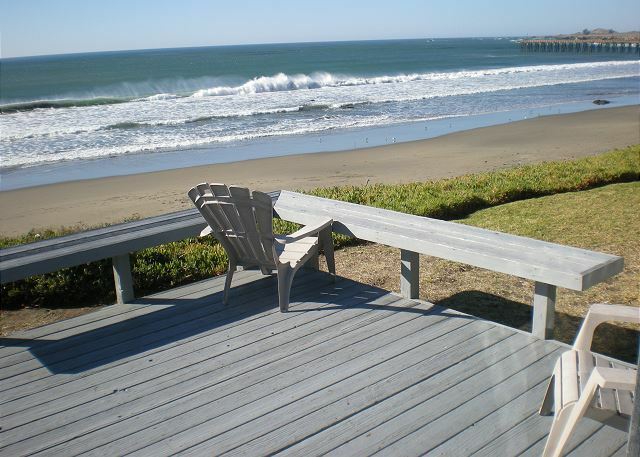 We were pleasantly surprised to show up to this home in Cayucos. The pictures do not do this place justice! The home is MUCH larger than the picture lead on to be. The living room is large with ample seating and a beautiful, large sliding glass door with direct access to the lawn/views of the ocean. 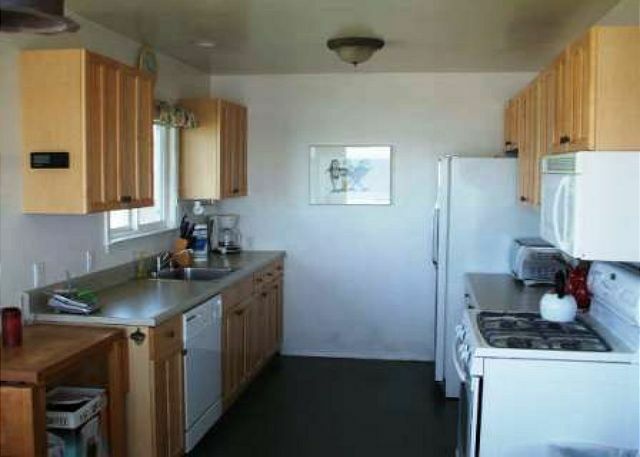 The kitchen is a great size with nicely upgraded appliances and countertops and have everything you would need to cook up your meals. The place was incredibly clean and comfy for our group. Don't forget to bring your linens - including hand towels! We would definitely rent this property again! Oh, and the ladies at the property management company are fantastic! Check-in was a breeze! One of the ladies had actually rented this property for the week following our departure and offered us a late check out because she wouldn't be arriving to the property until later that day. How nice is that!! Wow ! What a great house ! Great vacation ! House was so close to town, that was great. Rhonda & Teresa at Coastal Escapes are so great to work with ! We had a great time again. The weather was the best . This unit has everything a person can ask for. You just have to bring yourself and enjoy the ride. We try and come here two or three time a year. We are set up for our next trip. It is hard to just put this experience in just a few words , but I can tell you we will be back. The office staff was the best as usual. We always enjoy visiting with Rhonda and Theresa and Walter too. Also I did fix the light in the bathroom. As always, my husband and I had a, "bit of Heaven on earth" for an entire week. The right at your front door ocean views are spectacular! We love the beach house-ceiling night art, the comfortable couches, fully stocked kitchen and the decks! Please note that there is a light bulb out in the main bathroom above the sink by the window. We have never been more relaxed. For some strange reason this propert feels like home, my 4 year old kept calling it "her beach house", lol. We will definitely be back as this will make an awesome yearly destination. A word of advice though... Read all of the confirmation e-mail, these rentals are cash only, all I brought was a debit card, but they still accomadated me. As my cash was 150 miles away. Our confirmation letters clearly states that we accept Personal Check, Cashier's Check, Money Order or Cash. Please call us in advance if you have any questions or problems with our policey. We love coming here as often as possible. The views are spectacular! Such an amazing house! Location was perfect! 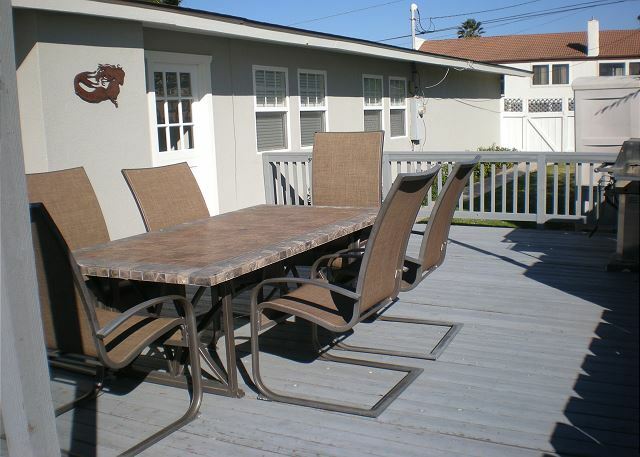 I loved being able to entertain our friends and family on the outdoor grass area and deck overlooking the beach! 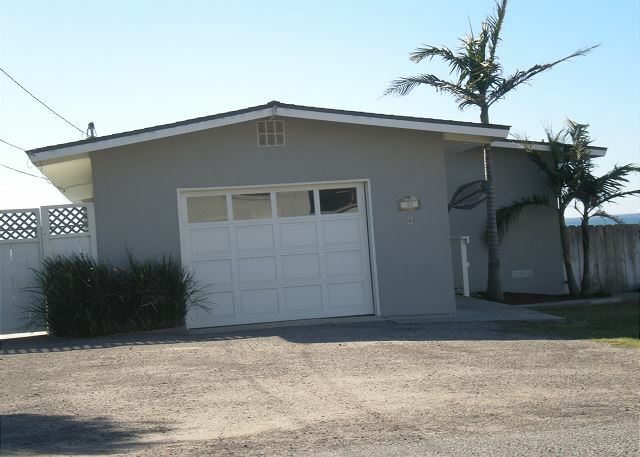 This home is right in downtown Cayucos, so it was so nice being able to walk down to duckies or the candy counter! Love this rental home! We have stayed at 40 Oceanfront many times over the last 20 years. The views of the water, Morro Rock and the pier are the best. The addition of a 2nd bath was a great enhancement. Our only suggestion would be better beds in the 2nd bedroom. 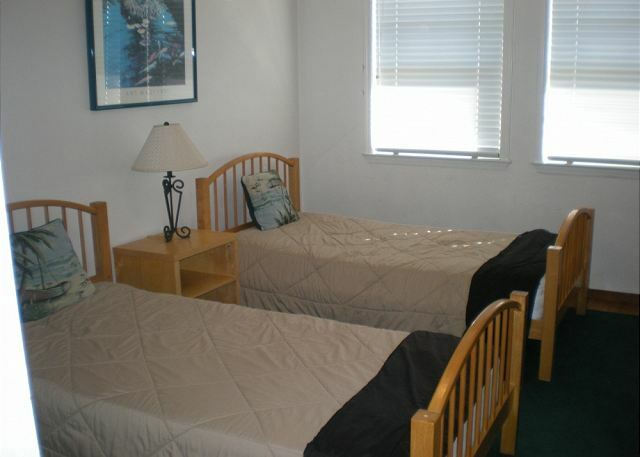 The two twin beds are separated bunk beds with no box spring and very low to the floor. They would be fine for little kids, but for older children or adults, they are no adequate. That room is probably large enough to put a queen bed and stacked bunk beds. For the amount charged for the rental, there should be better sleeping accommodations. We brought an aerobed this time. The ocean view from the house was amazing ! It was a great week for me and my family ! I just spent 5 relaxing days in this wonderful, clean, cozy house on the beach. It was perfect! This rental house is a great house to rent. It is clean and has everything we need. The location is amazing and watching the sea life from the beautiful deck is a great treat. We can't wait to go back. Ths was the second time we have stayed here. Its a great place. My family had a great time . Its a good location with everythng you need. We will be comng back. This is my favorite place on earth. Beyond surf, sea life and just plain fun, there is such great Karma here!! Adore the management:they are all over any issue, no matter how insignificant even if you make a mistake and there isn't an issue!! Owner provides many amenities for those who fly in and can't bring supplies. Shame on those guests who take them home with them, leaving nothing for the next guest. (IE) dish soap, laundry detergent, wax paper, foil, spices and more. Owners and management can only do so much and they do it with a smile. Again, rent this place and you will go back year after year. We had five great days and the weather was perfect. It is hard to describe how it feels to be this close to the ocean . This house has a way to make you feel at home and it is easy to just relax. We have stayed here before and have planned our next trip. Just a great place. Rhonda and Theresa are the best. They just know how to take care of guests. Thanks for a great stay . We have stayed at this houseseveral times and every time it has been wonderful. The weather perfect, location and view superior, very relaxing. Only one request, please add a card table for us puzzle makers and card players. Location is great and the view from the living room and breakfast nook is great. Love the protected patio. Problem is wall heater in bathroom that can get very hot and dangerous. The view from this home was spectacular. We loved the convenience of being home to prepare our own meals and being able to enjoy our meals looking out over the ocean. Easy access to the beach, a few steps down the back and walla! The tide would go down so much that the kids enjoyed playing in the sand. We spotted seals almost every morning and saw groups of dolphins jumping out of the water. That was a sight. I mainly dealt with Rhonda, who was very professional and courteous. We can't wait until next year, we are already booked for another week. We like to call it our home away from home. A cozy cottage perched on the bluff above the sand, steps from the beach. Incredible view miles up and down the coast with glass windows and doors facing the ocean. 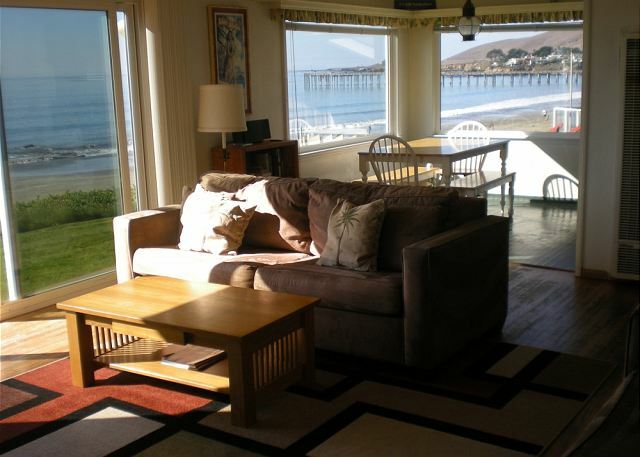 Walk to antiques and restaurants in Cayucos or drive to Cambria or nearby wineries. A wonderful getaway! 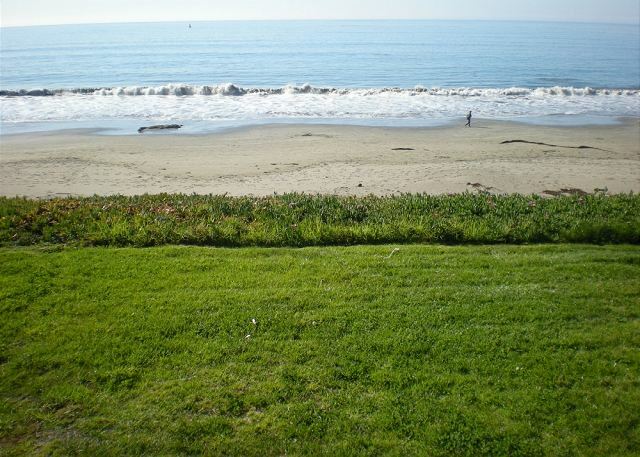 My friends and I visit this property once a year because it offers every comfort we need and has a gorgeous wide-screen (smile) view of the beach and ocean. I would only reluctantly recommend this property to a friend because we don't want it to be any more popular and therefore harder to rent for ourselves. Seriously, we all rave about this locale and the property management company. super nice in all ways! This home is a perfect location for rest and relaxation. Several friends and I decided to get away for a few days. It was a great weekend, nice to be so close to everything. We were able to walk to everything from food, fun to just browsing around. The best part was that we could walk right down to the beach no hassle driving or lugging stuff down to the beach since we were right there. Great view and wonderful accommodations. This is our second time in this house and it just gets better. We had five great days and the best weather. The sea life on the big screen was perfect. This house was perfect. The gas BBQ made things a lot easier for us . We sat on the deck and enjoyed the view. We are set up for next trip. Rhonda and Theresa are the best . They know how to treat people and can answer all your questions. Great staff. We will be back soon. Beach t.v. at its best! Viewed the Milky Way for 1st time! Perfect place! We're reserved thru 2015. So hurry save the date!Romantic and well stocked home. Bring food sheets and towels and have fun!!! GREAT VIEW. UNBEATABLE location. Family dinner on the deck with the class wall is a highlight. Nice kitchen and new appliance. Some part of the house is a bit rundown though(squeaking doors/floor), yet overall very clean. We have stayed in easily 6 different properties over the years. The best fit for our little family of 4 is the property at 40 Ocean Front. We settle in for the week and enjoy everything about the town, view from the house and all the beach/ocean have to offer. Staying at 40 Oceanfront is a true blessing. Beach T.V.. at its best ocean views stunning. Best ever total relaxation,peaceful sleep. I would say its 10 stars, not 5. Perfection is 40 Oceanfront. Always has been always was...and is. Heaven on earth and danced with the Dolphins! ,cooking in. Loved having W/D and clean clothes!! All kitchen equipment allowed us to cook anything. Walking the almost private beach could sooth the soul of anyone. We will be back, as well as some of our extremely large family, once we spread the word. Most relaxing vacation I have ever had. Thanks again Rhonda and wonderful owners! you "did it up" right! I can't recommend this location enough and also recommend checking out the Senior thrift store Community Center:we spent 20.00 for 200 dollars worth of awesome items. Even Loaned us a wheel chair! Lovely ladies! Too short! We had such a great time. Everyone from the 5 year old to the 87 year old had a wonderful time. No one wanted to leave we will definetly be back. This was the 8th time we have stayed at this house in Cayucos, CA. The only complaint we have is that the sofas are very uncomfortable to sit/lay on. For us older folks (with bad backs), it would be nice to have two recliners. Other than that, everything was great, as usual. We spent four wonderful days in Cayucos . I don't think you can find a better location. It is a easy walk to town and to the pier. The local food is great. The house was very comfortable and very clean with an unbelievable view. We felt like we were at our home except for the view. We are booked for another trip this year and next year too. I can see us coming to this place many times in the future. This place makes us want to sell our timeshare at San Luis Bay Inn. We do have two safety concerns that I hope can be addressed . It would be nice to have a grab handle in the shower to make it easier to get in and out. We also felt it would be easy to trip going down the stairs to the beach. I would imagine that there are a lot of hoops to go through for the stairs. We just walk down to the public access. We are already looking forward to our next trip. PS . The office staff is second to none when it comes to customer service. Our family of five LOVED the house and the amazing views! We had plenty of room and were very comfortable in the home. All of us want to come back. We love this property and have stayed in it 4 times. It was great!! We love the location and wish we owned this home. One recommendation is to have instructions for the DVD player which we couldn't use and couldn't find a manual for it. We called and asked for someone to call back but we didn't hear from anyone and therefore couldn't use the DVD player. Cayucos Vacation - over 20 years! As always we had a wonderful and relaxing vacation in Cayucos. The view from this house is spectacular and we even enjoyed the rain. A very clean, uncluttered, ocean front home with wonderful views.